Some high-profile congressmen who earlier supported two controversial anti-piracy bills are reversing their position on the legislation after Internet companies and citizens today expressed their strong opposition to the measures. The Stop Online Piracy Act (SOPA) and its Senate companion, the Protect IP Act (PIPA) are intended to strengthen protections against copyright infringement and intellectual property theft, but Internet advocates say they would stifle expression on the World Wide Web. CBS Corporation is among the media and entertainment companies that support the legislation. Sen. Marco Rubio of Florida, a rising star in the Republican party, was previously a PIPA co-sponsor, but he posted a Facebook note Wednesday morning explaining his decision to withdraw his support for it and calling on Congress to come up with new anti-piracy legislation. Rubio wrote that since the Senate Judiciary Committee passed PIPA "unanimously and without controversy," legislators have heard "legitimate concerns about the impact the bill could have on access to the Internet and about a potentially unreasonable expansion of the federal government's power to impact the Internet." While Rubio said he has "a strong interest in stopping online piracy that costs Florida jobs," he added that "Congress should listen and avoid rushing through a bill that could have many unintended consequences." Sen. John Cornyn of Texas, head of the National Republican Senatorial Committee, also posted a Facebook note urging the Congress to rethink the bills. It's "better to get this done right rather than fast and wrong," he wrote. "Stealing content is theft, plain and simple, but concerns about unintended damage to the internet and innovation in the tech sector require a more thoughtful balance, which will take more time." SOPA, PIPA today: Internet on strike! PIPA is slated for a test vote in the Senate on Tuesday, but a number of other senators today voiced their concerns about the legislation. "I support intellectual property rights, but I oppose SOPA & PIPA," tweeted conservative Sen. Jim DeMint of South Carolina. "They're misguided bills that will cause more harm than good." Sen. Scott Brown, R-Mass., who's in a competitive re-election campaign this year, also tweeted that "the Internet is too important to our economy" to vote in favor of PIPA or SOPA. Sen. Susan Collins, R-Maine, also said in a statement that PIPA, as currently drafted, "needs significant revision." Concerns appear to be growing on the House side as well. Rep. Lee Terry, R-Neb., is pulling his name from the list of SOPA co-sponsors, the Omaha World-Herald reports, as is Rep. Ben Quayle, R-Ariz., according to Politico. Rep. Gerry Connolly, D-Va., reiterated his opposition to SOPA on Twitter, where he urged his constituents to contact him on the issue via Facebook, since his House site has been overwhelmed by visitors. Connolly's office told Hotsheet the congressman has received hundreds of calls today from his tech-savvy, northern Virginia district, almost universally in opposition to the legislation. 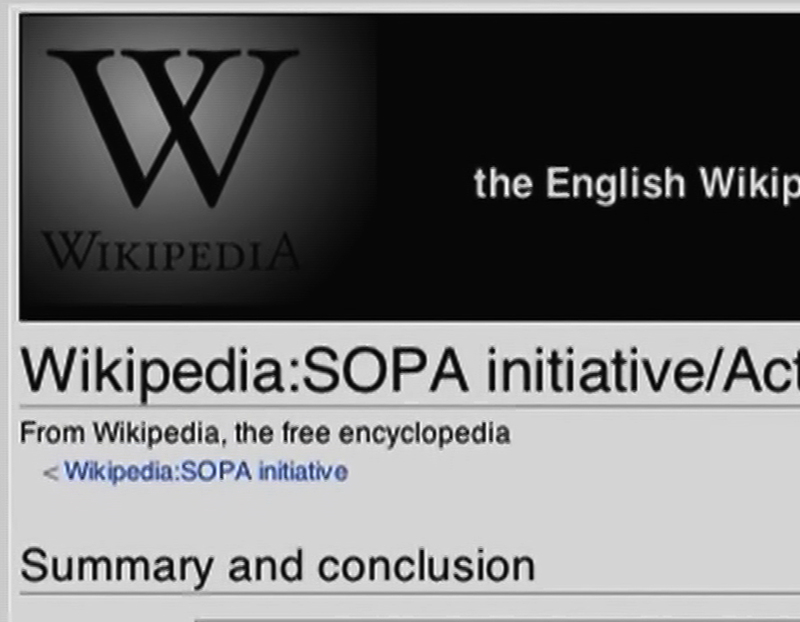 Those calls were likely spurred by the "Internet blackout" that sites like Wikipedia, Reddit, and thousands of other smaller sites are conducting in protest of SOPA and PIPA. Some politicians took part as well -- Rep. Earl Blumenauer, D-Ore., is blacking out his congressional website from 12 p.m. to 1 p.m. PT to express solidarity with the opposition. Opponents of SOPA and PIPA celebrated when, earlier this month, authors of both bills decided to set aside the most controversial aspect of them -- language that would have let the Justice Department force Internet Service Providers to block the domains of suspected foreign "rogue" sites. Still, PIPA author Sen. Patrick Leahy, D-Vt., said in a statement Tuesday that the arguments against the legislation are "flat wrong" and that sites like Reddit and Wikipedia wouldn't be affected by the bills. "Hiding behind the black box of self-censorship does not resolve the problem that is plaguing American business and hurting American consumers," he said. "Protecting foreign criminals from liability rather than protecting American copyright holders and intellectual property developers is irresponsible, will cost American jobs, and is just wrong." House Judiciary Committee Chairman Lamar Smith, R-Texas, who sponsored SOPA, called the Internet blackout a "publicity stunt," saying in a statement, "Perhaps during the blackout, Internet users can look elsewhere for an accurate definition of online piracy." Smith said Tuesday he expects the committee to continue work on the House bill in February. House Speaker John Boehner on Wednesday also said he expects the Judiciary Committee to work on the bill more before it's brought to the House floor. "It's pretty clear to many of us that there is a lack of consensus at this point," Boehner said to reporters. Meanwhile, Rep. Darrell Issa, R-Calif., chair the House Oversight and Government Reform Committee, has introduced alternative legislation called the Online Protection and Enforcement of Digital Trade (OPEN) Act. "Once members of Congress see a viable alternative... I think we can get to a consensus" on the issue of combating piracy, Issa said Tuesday.